It happens every year around this time: every pet store you walk into has Halloween costumes for pets for sale. Your Facebook feed explodes with photos of cats and dogs in costumes. Admittedly, some of the photos are adorable. But do you really think cats, if asked, would want to dress up in anything but their own beautiful fur coats? I’m not a fan of putting outfits on cats unless they’re photoshopped. I think most cats would find it stressful. There may be some cats who are the exception, but I think they’re few and far between. I’m guessing that if you were to ask the cats who seem to tolerate being dressed up what they really think, you’d get an earful of not so g-rated feline language from them. Does dressing up your cat enrich his or her life? 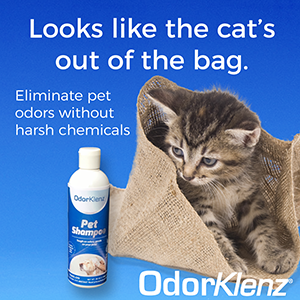 You know your cats best. If you really feel that they don’t mind being dressed up with a fancy costume or a hat, and if you just can’t help yourself, then by all means, go for it. But please ask yourself this question first: Does dressing up your cat enrich his or her life? I can’t imagine that the answer to this question is anything but a resounding NO for any cat. If you want your cat to look festive for Halloween, why not dress her up with a seasonal collar? 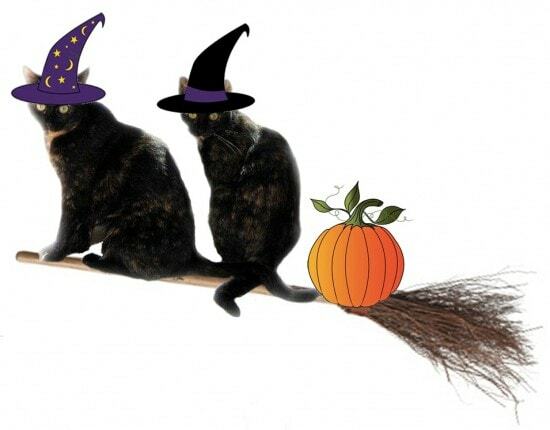 And if you just can’t resist the lure of adorable photos of cats dressed up for Halloween, why not do what I do for Allegra and Ruby, and turn to Photoshop or any of the numerous photo editing apps on your phone? What do you think? Are Halloween costumes for cats okay, or are they a no-no? i agree. Last year in Halloween party, my dog was scared after wearing the weird dress. Avoid it. Thanks for the share. We have a pet costume party at our offices each year. Mostly all dogs which is not a problem. Usually, the kitties come in with a Halloween collar on or something that doesn’t bother them. If it does then we take it off right away. Have a great day. I have two cats who are leash/harness trained, and they also enjoy getting dressed up, but they are extremely outgoing cats and anything that equals attention and/or food is a go for them. If I hold a sweater or a harness, they’ll come running, tail in the air! I have three others I wouldn’t even try it with, because I know they’d dislike it. So, it’s all dependant upon the individual cat, IMO. I agree- I have 5 cats and they would hate wearing any kind of costume. I did have a Santa outfit with just a cape and hat with Velcro at the neck. There was no way any of the cats would want to wear it- I did drop it on the most placid one, but the expression on his face said it all. I think you need to know your cat and read their body language- some of mine love to be brushed, and seem to find it soothing- but soon tell me when they have had enough. Did someone in this thread actually call it abuse? I truly think it’s more damaging to have other cat caregivers make such judgmental comments than it is to put a cat in a costume. Perhaps if you shove a cat into a costume and require them to wear all day, but come on, please don’t make such a blanket statement… especially when there is real abuse and cruelty occurring every moment. As someone who trains and practices play therapy with at least a dozen of cats weekly, I can say I agree that it totally depends on whether you are dealing with willing participants and believe and can be part of enriching/interactive play and training. In my own home, I have one cat that it would stress out so I would never dare, but an other who enjoys the attention and considers it a game for to have a quick treat exchange for a hat on the head. Definitely against. Dressing up your cat at any time is simply for your own ego and enjoyment. For me, it is entirely offensive to the natural dignity and beauty of a cat. I couldn’t agree more, Barbara! Definitely NO from me. I think it makes fools of them, which they most definitely aren’t. Found all comments interesting though, and for the right reasons can appreciate why some cats will be happy with any sort of costume. I dressed up my cat Tyson for the first time, but for her benefit, not mine. Cesar agrees that putting your animals in protective outfits is fine. We have begun shaving my elderly cat as she can no longer keep her long fur untangled. We tried brushing her, but she saw it as torture. Tyson loves her sweaters, and if this one is an orange pumpkin, so be it. She also loves her pink or gray sweaters that keep her toasty warm. But like I said, they are for her benefit, always keeping her comfort factor into play. No frilly ballerina outfits. I’m sure you would agree in this instance it makes sense. Thanks for addressing a pet peeve of mine (puns intended…lol). I hate seeing fur babies dressed in anything. It’s abuse, plain and simple. Maybe there are exceptions, but why do it? It’s sure not for their enjoyment. Very timely post, and so very true! I would have to say that 99% of cats do not enjoy wearing costumes and even wearing them for a quick photo is distressing to most. But as Ingrid says, there are exceptions and I think, as Connie said, for me and I can assume Sparkle’s human, what we do is part of the human-animal bond for us and our cat. I treasure the one-on-one time Coco and I have together when we travel to pet blogging conferences and attend fund raising pet fashion shows to help homeless pets. But I am very attuned to Coco’s emotions and if I feel she is tired, or not relaxed, I will undress her and give her some time out, in her rolling cat bed, the Pink Catillac. I do get negative comments from time to time, but most people while saying their cat would hate it, applaud Coco’s sweet disposition and outgoing personality and the fact that there is a reason and cause for her dressing up. At home, she goes au natural and we leave the dressing up for a cause. None of my cats are fans. I’ve had some really great annoyed looking photos of trying it though but it was pretty stressful for all involved. Chey even hates collars! She looked so mad, that someone photoshopped that image into a Christmas Grinch and it’s priceless. Each of those things are only things I have done once. We did get one of those plastic skeleton cat as a Halloween decoration and I think that will look great in a costume (which will take us through all the fall holiday costume and dress up looks…). That’s an interesting take on the topic, Connie. While I don’t think dressing cats up has anything to do with fostering the human animal bond, I suppose if you must put outfits on them, making it a positive experience with lots of treats is the way to go! Cody is a fearless, completely confident cat (I don’t think that being confident has ANYTHING to do with whether or not a cat likes being dressed up, nothing at all). He does NOT like things on him……he hates tunnels…blankets over his head…etc. Not liking something has nothing to do with being fearful or not being confident. Dakota detests many things on him but Dakota is NOT confident like Cody is. Dakota is more fearful and reticent………he also rarely sits still long enough to try and put anything on him. We know our pets best, but to force a pet to wear a costume for an extended period of time for OUR pleasure is completely inappropriate and inexcusable. I tried a couple of different things with my last cat at two different times, thinking maybe it was the type of thing I put on her. I put an elastic/ cloth joker collar on her and the other time, I put on a reindeer head piece. Each time she gave me a dirty look, so I never tried that again. I doubt I would try with a different pet. Not sure if this already posted. From time immemorial, kids have dressed cats in dolls’ clothes and that is one way they interacted. Out of my 10 cats, 3 that were socialized to our attention from birth would adore the attention and costumes; the rest, eh, not so much, in fact, fuggedaboudit! How about decorated collar or pet bed? Thx CC for speaking up for the felines, because many will be uncomfortable. I think a side-order of treats should accompany a dressing. Remember dolls (before electronic devices)? Kids always used to dress kitties in their dolls’ clothes from time immemorial. Lots of cats adore the attention. Out of my ten cats, I’d say three would absolutely LOVE it; these 3 were socialized to our attention from birth. The remaining, eh, not so much–fugeddaboudit. But instead of costumes, decorative collar or decorated pet bed. I don’t dress mine up. They would hate it. I do the photoshopped thing if I want a Halloween photo. It’s a resounding NO from me. I hate pet costumes. The animals always look miserable to me. I don’t really like pet clothes either. However, I have a chihuahua/min pin that freezes in the winter. She has a few sweaters and her own crocheted blanky. She loves the sweaters – I’m guessing because she knows they keep her warm. For me is an absolute no-no-no any costumes for any non-human people. (Even humans when they are too young). Unless they need it for climate reasons… and even then there should be limits. Usually they are uncomfortable when dressed. I put costumes on one of my cats. she doesn’t seem to mind much. Another will only wear collar type things and the third refuses to wear anything except her beautiful fur. I tried fancy Christmas collars on my two cats (at the time) many years ago. It lasted maybe 10 minutes – they were very unhappy. I have never attempted it again with any of my cats as it just would stress them out too much! I confess – I’m one of those exceptions! In fact, I barely notice I’m wearing anything sometimes! Especially if there are treats involved! Even so, my human keeps an eye on me and any costume that does seem to bother me gets removed quickly. You are exceptional in so many ways, Summer. I have rarely met a cat as confident as you. Some 25 or so years ago, I crocheted a Santa Claus hat for our first cat. We managed to put it on him twice I think, and we took some photos for that years Christmas card – looking at it recently I could tell just how miserable he was. Tried the hat on my two next cats, and they hated it! With the cat I have now, Kajsa, I will never ever do the same mistake. So unless you can actually tell that your pet is not bothered at all, I say go Photoshop!